Don't let a few permanent marker scribblings stand between you and your next secondhand bargain. 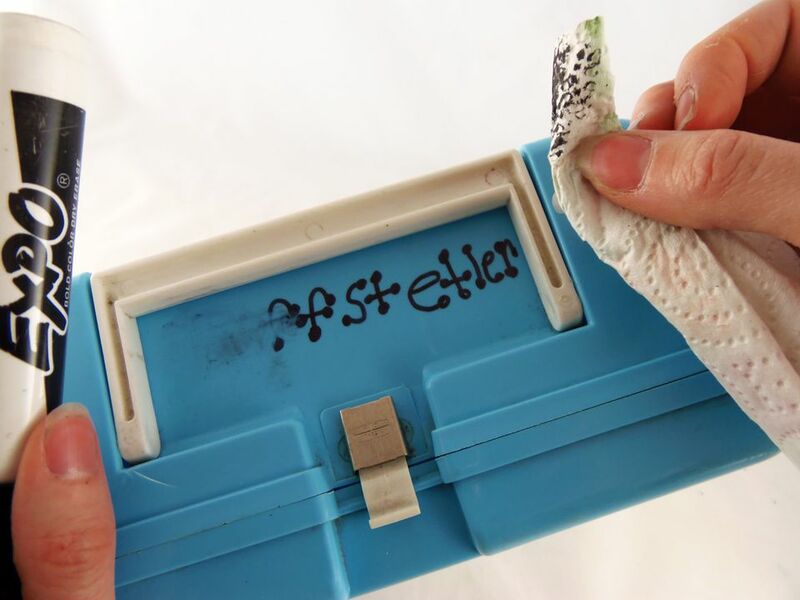 You only need to gather a dry-erase marker and cleaning rag to remove those marker stains. The process takes just a few minutes! To remove permanent marker from hard plastics, follow these simple steps. Color over the permanent marker you wish to remove with a dry-erase marker. Wipe over the area with a rag, and the permanent marker should come right off along with the dry-erase marker. Repeat if any permanent marker remains. This process works so well because the rubbing alcohol in the dry-erase marker eats through the permanent marker, while the tip of the marker acts like a little scrub brush, lifting and removing the marks. Rubbing alcohol is an excellent solvent, capable of dissolving all sorts of tough stains and residues, even many that pricey, store-bought cleaners won't touch. It'll remove ink and paint from clothing, carpet and upholstery, adhesive residue, kitchen grease, water spots, bad odors, and even the fingerprints on your stainless steel appliances. And it's a highly effective sanitizer too. Add a bottle to your cleaning arsenal, so you can start putting this inexpensive but effective cleaner to good use. Rubbing alcohol isn't the only household product that you can use to clean your home. Before you race to the store to restock your cleaning caddy, see if you have something on hand that you can use to tackle your next cleaning task. Once you test a few of these ideas out, you may just be surprised by how unnecessary many of those commercial products you've been buying really are. Vinegar: This may be the world's—and certainly your household's—most versatile and effective cleaning agent. You can clean kitchens, including everything from dishwashers to microwaves, bathrooms, stainless steel, and washing machines. You can even use it to wash your laundry or dishes. Baking soda: Your No. 2 household cleaner, baking soda has almost as many uses as vinegar. Hydrogen peroxide: Use this handy liquid to remove blood stains and mold, and even whiten your teeth. And if you're just trying to become a better stain fighter, there are plenty of ways to use several items you likely have at home without spending an extra dime. They'll help you get stubborn stains out of all sorts of things, without a call to the pros, and without cumbersome trial and error. You can remove crayon with vinegar or make your own bleach alternative. You can also easily make homemade carpet cleaner with white vinegar, baking soda, hydrogen peroxide, and plain old water.